Thor's hammer is missing again. The thunder god has a disturbing habit of misplacing his weapon--the mightiest force in the Nine Worlds. But this time the hammer isn't just lost, it has fallen into enemy hands. If Magnus Chase and his friends can't retrieve the hammer quickly, the mortal worlds will be defenseless against an onslaught of giants. Ragnarok will begin. The Nine Worlds will burn. Unfortunately, the only person who can broker a deal for the hammer's return is the gods' worst enemy, Loki--and the price he wants is very high. 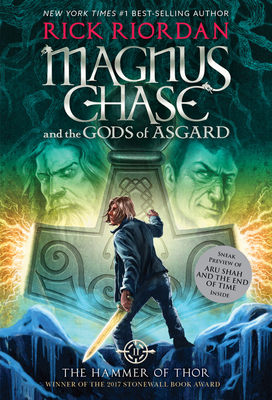 Bonus content includes a chapter from Magnus Chase Book 3: SHIP OF THE DEAD and a chapter from the first Rick Riordan Presents book, ARU SHAH AND THE END OF TIME by Roshani Chokshi. Rick Riordan, dubbed "storyteller of the gods" by Publishers Weekly, is the author of five #1 New York Times best-selling middle grade series with millions of copies sold throughout the world: Percy Jackson and the Olympians, The Heroes of Olympus, and the Trials of Apollo, based on Greek and Roman mythology; the Kane Chronicles, based on Ancient Egyptian mythology; and Magnus Chase and the Gods of Asgard, based on Norse mythology. Rick collaborated with illustrator John Rocco on two #1 New York Times best-selling collections of Greek myths for the whole family: Percy Jackson's Greek Gods and Percy Jackson's Greek Heroes. Rick is also the publisher of an imprint at Disney-Hyperion, Rick Riordan Presents, dedicated to finding other authors of highly entertaining fiction based on world cultures and mythologies. He lives in Boston, Massachusetts with his wife and two sons. Follow him on Twitter at @camphalfblood.